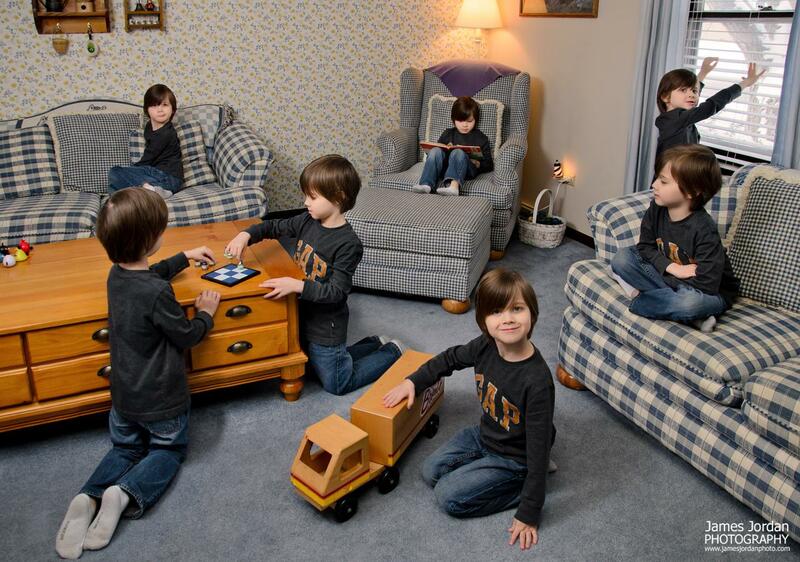 Use the magic of digital photography and cloning when editing to create a single image full of duplicate subjects. Taken from the title of a mid-1990s comedy film about a workaholic who clones himself to get more things done in a day, multiplicity pictures employ the magic of digital photography to create images full of duplicate subjects. The concept behind photographic cloning is fairly simple. The camera is placed on a tripod and the scene is framed in the viewfinder. Then multiple pictures are taken of the subject in various sections of the frame. The images are brought into a photo editing program that supports layers. The subject is selected from one image then copied and pasted into the second. The process is repeated for each “clone” added to the scene. The setting was selected and framed up with the camera on a sturdy tripod. One shot is taken of the setting without anyone in the frame to be sure composition and exposure are set to our liking. This is important – to make the editing process as easy as possible and to increase the believability factor of the final image, the exposures of the individual shots must be identical. If you shoot on auto, you risk having the exposure change slightly as your subject moves about the frame. If that happens, you’ll need to adjust each frame’s brightness to match the others while editing. The more frames you have, the bigger your headache will be. If you’re already used to shooting in manual mode, locking in the exposure, white balance and focus will be no problem. If you’re not one to venture beyond automatic, now’s a good time to learn how to set an exposure. One method is to take a shot on automatic, then check the resulting image’s exposure information to see which settings the camera applied. Then set the camera to the same shutter speed, aperture and ISO as your test shot. Refer to your camera’s manual to learn how to set exposure, focus and white balance manually. Now that you’ve locked in your settings, direct your subject around the frame and shoot away. Once you have your set of images, open the first one in your image editing program. For the purposes of this article, Adobe Photoshop Elements is used. Open the second image. Use the polygonal selection tool to roughly outline your second subject. There’s no need to carefully trace your subject because the background surrounding the subject will match that of the first picture. Apply a light feather to the selection – about 16 pixels will be enough to hide any sharp outlines. TIP: If your subject is throwing a shadow, be sure to include it in your selection. Copy and paste the selection into the first image, then move it onto position, using the nudge feature to fine tune placement. If you’ve securely placed your camera on a tripod and locked in your exposure, the second subject will seamlessly blend into the first picture. Repeat the process for each additional clone. The only time you’ll need to carefully select around a clone is when one clone appears behind another. When all of your clones are in place, flatten the image, make any necessary adjustments to the overall picture then save. Voila! You’ve created magic.